This two-disc DVD set will take the viewer through all the necessary procedures involved in the braiding of a rawhide reata. The instructions are extreamly clear and concise, and filled with the "little details" that make the "big difference" in a piece of quality cowboy gear. However, this film is much more than simply an instructional video. 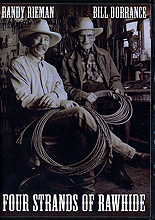 It is a rare opportunity to enjoy Bill Dorrance the masterful braider, teacher and horseman as he shares his stories and insights into rawhide braiding, roping, horses, and life.